Zion Market Research has published a new report titled “Ceiling Tiles Market By Product Type (Mineral Wool, Metal, Gypsum, and Others), By Application (Commercial, Healthcare, Educational, Industrial, and Others): Global Industry Perspective, Comprehensive Analysis, and Forecast, 2017 - 2024”. 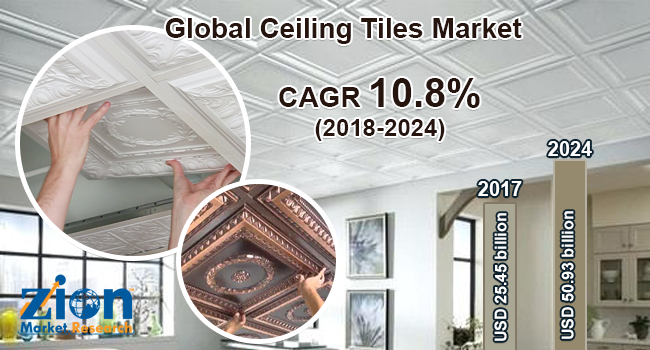 According to the report, global ceiling tiles market was valued at approximately USD 25.45 billion in 2017 and is expected to generate revenue of around USD 50.93 billion by the end of 2024, growing at a CAGR of around 10.8% between 2018 and 2024. The global ceiling tiles market is anticipated to witness substantial growth over the forecast period on account of increasing demand from the construction industry. Ceiling tiles play an important role in enhancing the acoustics of a building and improving it's thermal insulation. They are secondary ceilings attached to an existing ceiling. The growing construction industry and the growing demand for recyclable products are predicted to drive the ceiling tiles market growth over the forecast period. The products used in the production of the ceiling tiles are returned to the manufacturer after use, for recycling. Furthermore, urbanization and population explosion is expected to boost the construction activities across the globe creating opportunities for the ceiling tiles market. However, fluctuation in prices of raw materials used in the manufacturing of ceiling tiles is expected to curb the growth of the ceiling tiles market. Mineral wool segment dominated the ceiling tiles market in 2017. They are used in various commercial buildings such as hospitals, offices, and retail stores owing to its high fiber tensile strength. They readily absorb moisture and odors. Gypsum accounts for the second largest market share and is expected to grow during the forecast period. Commercial segment emerged as the leading application segment by accounting for most of the global market share in terms of revenue and is expected to witness significant growth within the forecast period. The industrial segment accounted for the second largest market share. Ceiling tiles used in the commercial sectors offers sound control properties and easy access to ducts. In the healthcare sector, the ceiling tiles used are washable and bacteria resistant. These factors are expected to increase the demand for ceiling tiles, thereby aiding in the growth of the ceiling tiles market. In terms of geography, North America was the largest market in 2017 for ceiling tiles in the world due to the existing construction industries. Globally, the U.S. dominates the construction industry where ceiling tiles are mostly used. Europe accounted for the second largest share followed by the Asia Pacific. Moreover, the global ceiling tiles market has huge opportunities in the emerging markets of the Middle East & Africa due to increasing population in this region and the rising investment in infrastructure and construction sectors. Some of the industry players operating in the ceiling tiles market are SAS International, ROCKFON, Armstrong World Industries, Inc., Grenzebach BSH GmbH, Saint-Gobain S.A., Odenwald Faserplattenwerk GmbH, USG Corporation, and Knauf, among others.